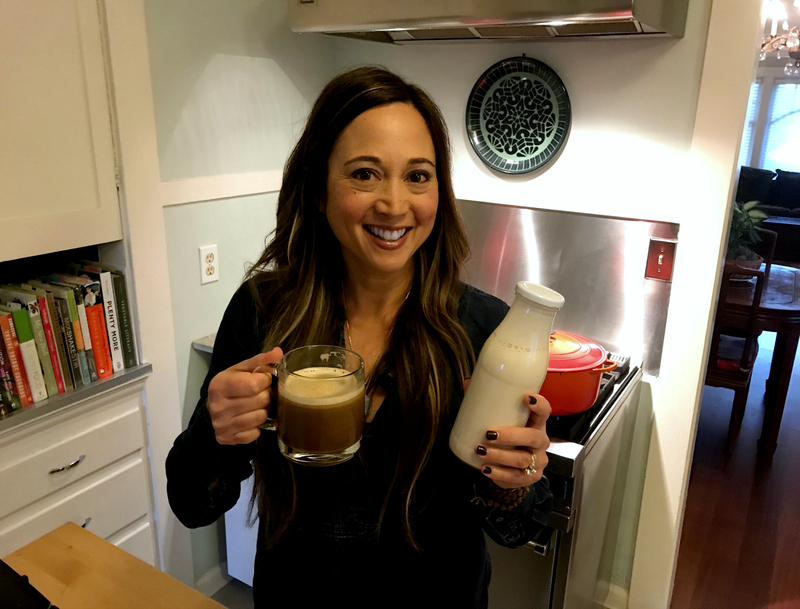 This week on More Good Day Oregon, I made an Almond Chai Coffee Creamer that I think you’re going to absolutely love. It’s so, so creamy — as well as dairy (and guilt) free! Cow’s milk products — everything from milk for our cereal to Greek yogurt — have historically been an integral part of traditional diets all over the world. However, in recent years, many people have figured out that they can’t digest dairy properly, and they’ve had to go dairy-free. But here’s the thing with most commercially available plant milks: they can be light on the actual nut content — which means that a serving of nut milk only delivers a fraction of the nutritional benefit compared to handful of actual nuts. Commercial nut milks can also be high in added sweeteners, flavorings, and stabilizers. Carageenan, a seaweed derivative that is often used as a stabilizer in nut milks, has come under scrutiny in recent years because of its potential connection to gastrointestinal issues. To date, the FDA and World Health Organization claim carageenan is generally safe, but a lot of consumers are now wanting to use products that don’t use it. As with most things, homemade is usually better — and better for you. And this is especially true of nut milks. Yes, they do require a high speed blender such as a Vitamix, as well as a little extra time in the kitchen. Side note: you can save some money by purchasing a reconditioned blender on the Vitamix website. But even if making nut milk seems high maintenance, the payoff in terms of taste and nutrition is huge. Homemade nut milk tastes so much better than store-bought varieties. You can adjust the water-to-nut ratio for a creamier and more nutrient-dense version, and you can also add your own flavorings, as I’ve done with this Almond Chai Coffee Creamer. There are so many reasons to love this coffee creamer. Let’s start with the almonds. Almonds have developed a bit of a superfood reputation for good reason. For starters, almonds — when eaten in combination with other heart-healthy and high-fiber foods, have been shown to reduce cholesterol as much as first-generation statins. Lower LDL levels (the “bad” cholesterol). Reduce risk of weight gain, and provide better weight control. Reduce levels of C-reactive protein, a marker for artery-damaging inflammation. Improve blood flow by providing magnesium. Regulate blood pressure and heart function by delivering potassium. Decrease post-meal blood sugar spikes, which is helpful for people with pre-diabetes or diabetes. Here’s another way this Almond Chai Coffee Creamer may help you out in the health department: chai spices such as cardamom and pepper. What? you might be saying, spices are good for you too? Absolutely! Spices and herbs are among the foods that are highest in antioxidant content, so use them freely in your food preparation. 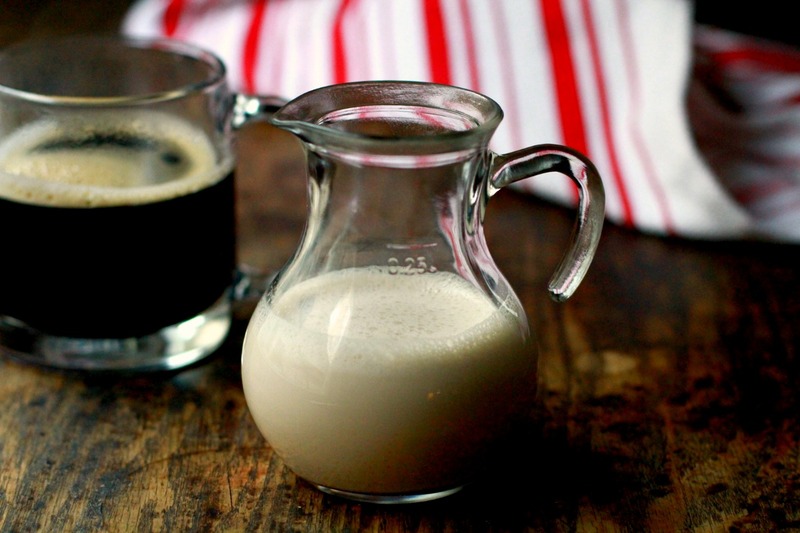 Just click here to check out my recipe for Almond Chai Coffee Creamer. I hope you try the recipe — let me know if you do by tagging me on Instagram at @mospo. 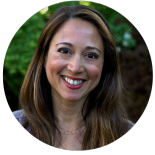 If you’re still thinking that making nut milk is too high maintenance for you right now — and you live in the Portland, Oregon area — try aMYLK delivery from my friend Amy. She makes an amazing line of plant milks that are made from real food ingredients (no scary additives). They’re creamy, high in nut content, and so delicious you’ll want to chug them straight from the bottle. My personal favorite is Hazelnut Vanilla. Amy also occasionally hosts pop-up events throughout Portland — check out the aMYLK website for details. In celebration of the new year, I created a fun freebie for you! This special PDF includes 5 recipes to keep your body healthier and happier in the new year. All of these delicious recipes are plant-based, gluten-free, and dairy-free. They’re also very simple to prepare. Because we’re all busy, right? Blueberry Flax Smoothie: Packed with antioxidants, fiber, and healthy fat. Green Tangerine Smoothie: Take advantage of citrus season with this healthy smoothie. Kale Salad with Maple Tahini Dressing: Tame those bitter greens with this subtly sweet dressing. Creamy Dairy Free Tomato Soup: My makeover of the Pioneer Woman’s Sherried Tomato Soup. Coconut Curried Lentil Soup: Hands down, one of my most popular recipes. 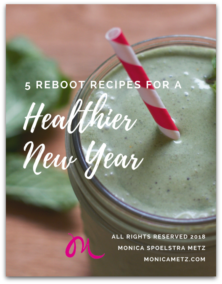 Click here to grab your freebie: 5 Reboot Recipes for a Healthier New Year. Remember to tag me on Instagram if you try the recipe.